It’s the middle of May and I can’t help thinking of summer. While its’ been warm in Atlanta since late February, Memorial weekend marks the unofficial start of summer. I’m filled with thoughts of all things summer; brightly colored bikinis, days spent poolside, dining al fresco and festivals in the park constantly occupy my mind. I’m ready to jump in head first. As a tropical girl at heart, I crave the hot rays of the sun so I take advantage of any opportunity to bask in it warmth. This means lots of grilling. I love the amazing, smoky flavor that develops from grilling over charcoal, I’m sort of addicted. I like to think that it’s virtually impossible for food to taste bad once it’s grilled, provided that it’s not burned. I had a bit of jerk seasoning left over from the last batch that I made which I used to marinate the chicken overnight. While I wanted the flavor of jerk, I wanted to tame the heat just a tad bit. Adding BBQ sauce provided the perfect combination of heat and sweet. A few bites of these legs and I knew that my summer had officially began. This looks amazing! I can’t wait to try it!Looks really easy too! Always a great choice! Hard to believe summer is almost here. Love that you added the sweet to the sauce. We love that touch and often do it with molasses, honey or brown sugar. Possibly a mixture of all of them. Orange juice is nice too. The pineapple adds a summery shine to the sauce! Gosh that looks delicious and yes…it screams summer bbq’ing is here. We bbq’d salmon over a cedar plank and I thought I was in heaven it was so delicious. Today we bbq’d a pork tenderloin and tomorrow grilled burgers are ready to go. I’ll never make it to vegetarian-hood. Eggplant sound like an excellent substitute. I would like to use chicken cutlets for this recipe. Should I use less or more jerk seasoning? Liz if you’re using the same amount of chicken then you don’t have to adjust anything. I can’t always do jerk food but add some sweetness in there and I might be good! What a pretty double! Liz, good idea to use cutlets with this same recipe. Could you use OJ instead of pineapple juice? What do you do with the rice vinegar? Does that get mixed with the BBQ sauce? Hi Radha, you can substitute OJ of you prefer it. The rice vinegar is mixed with the BBQ sauce. 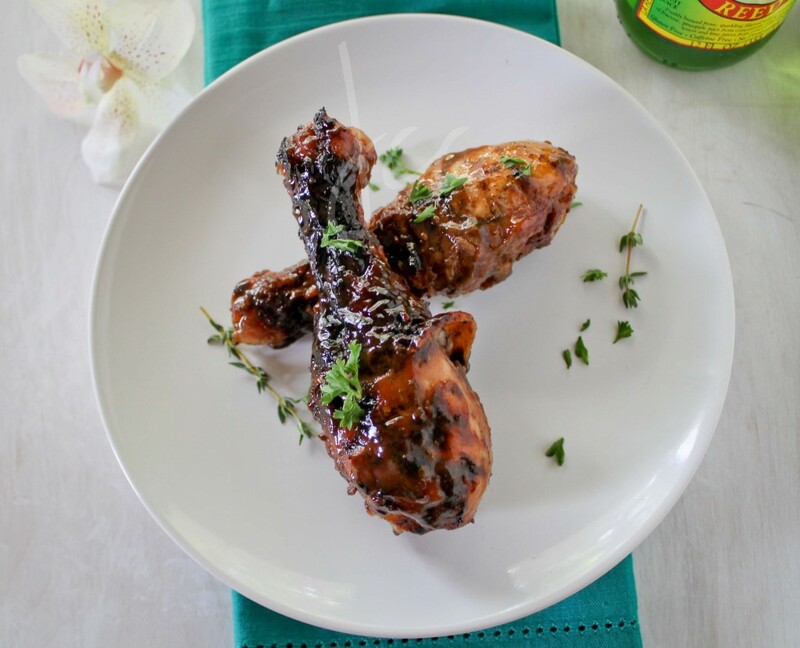 I love grilling jerk chicken but I do the drummets and wings and their always a hit. I already have the meat on marinade for the BBQ tomorrow and your sauce is going to take it to another level. I anticipate several marriage proposals….. 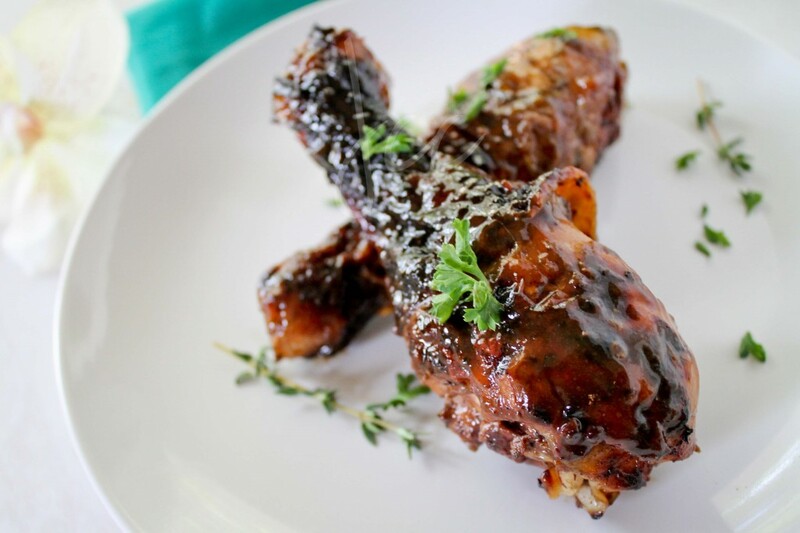 I highly recommend using the authentic wood/leaves/chips that they use in Jamaica to make jerk chicken – I only found one place that imports them – http://www.pimentowood.com Great results! Hope you have a rice and peas recipe in the future. Hi Michelle, I can’t vouch for store bought BBQ Jerk seasoning as I made my seasoning from scratch. Next time you can try adding more jerk seasoning to the mix. Thanks for stopping by and for the feedback. hi will definitely try this, i will bake mine. will try it with fish too .